Coloring Book N°1 / Points: Yellow/Red/Bleu/Green is a ‘interactive’ performance. It is composed by an object (a coloring book) and performers on stage. In other words, Coloring Book N°1 / Points: Yellow/Red/Bleu/Green uses a coloring book to illustrate gestural and bodily combinations on stage. The public receive the Coloring Book N°1 / Points: Yellow/Red/Bleu/Green and some pencils at the entrance of the hall. A voice off, recorded, gives the rules of the play. The public can colour it during the performance, or do it later (as a memory exercise) or never do it. Coloring Book N°1 / Points: Yellow/Red/Bleu/Green is the booklet of the play and it is an art object. Coloring Book N°1 / Points: Yellow/Red/Bleu/Green is the first of a series. 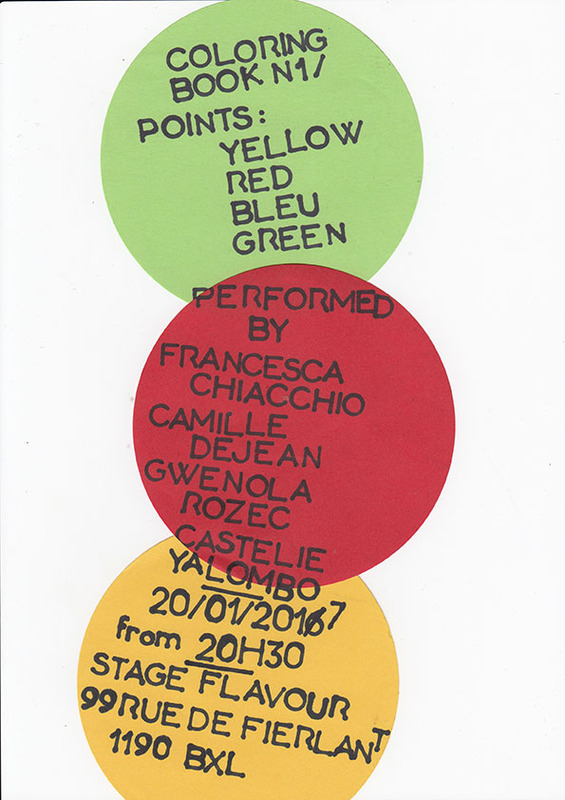 Coloring Book N°1 / Points: Yellow/Red/Bleu/Green has been performed by (alphabetic order) francesca Chiacchio (green/voice), Camille Dejean (red), Gwenola Rozec (Bleu), Castelie Yalombo (yellow). Coloring Book N°1 / Points: Yellow/Red/Bleu/Green exists in 50 copies.